If you are driving, metered parking on 79th street is FREE on Sundays! To enter our sanctuary, please ring the doorbell and listen for the buzzer, allowing entry. Be mindful in this space and please speak in low tones. You may hang your coat and remove your shoes at the door. Be sure to keep any valuables with you and head over to the front desk. There you'll be greeted by your hostess. Aya will confirm your reservation or share the menu of services if you are walking-in. After signing our liability waiver (first visit only), you may help yourself to a cup of tea and have a seat in the waiting area. If you are attending a yoga class, please arrive 5-10minutes early to settle in. Enter the yoga salon and grab any props you may need from the prop shelf, on your way to a mat. Clean yoga mats are laid out when you arrive, choose one or place your own on top. Please alert your instructor of any injuries or conditions that could effect your yoga practice or cause you to need support, BEFORE class begins. Yoga clothing is the best attire for accessing all of our services. For a full acupuncture treatment, the therapist will need access to your arms and legs. Please wear clothing you can easily roll/pull up, to get the most out of your treatment. We are equipped to take credit cards, but prefer CASH for practitioner gratuity. PLEASE SHOW LOVE TO YOUR HEALING-PRACTITIONERS! WELCOME GOOD PEOPLE! OUR NEXT SUNDAY SANCTUARY is 4/21/19 :: Reserve today! Sunday Sanctuary Community Yoga is a celebration of LIFE! We come together to drop into ourselves, breathe deeply and move intentionally. Aya uses music, yoga and her own brand of affirmative speech to help community connect with and fully realize the joy of being in the body. The all-levels flow practice, is best suited for practitioners who have a basic understanding of Vinyasa yoga. Please bring yourSELF, your mat, a towel (if you sweat with moderate practice) and your open heart. Come ready to be in community with other amazing folks who also share a love of yoga and safe spaces, welcoming the burgeoning community of south side yogis for practice. PLEASE NOTE THE NEW POLICY: Late arrivals will not be admitted to practice. We do not refund or credit missed classes. Scroll down to book Community Yoga! $25 Haji Treatment :: (MUST BE BOOKED ONLINE) fill out our short intake form and receive a 1hr treatment, designed specifically to address your health concerns. Our acupuncturists can confront a wide variety of health conditions by placing needles at certain points on the hands, arms, feet, legs and head. This is known as "distal acupuncture" Allowing the practitioners access to your arms and legs, will give them more treatment options and increase the likelihood that you will leave feeling better. This form of treatment is recommended for both chronic and acute health challenges. Please dress accordingly or bring a change of clothes (shorts + tee). SCROLL DOWN TO BOOK 60min COMMUNITY ACUPUNCTURE APPOINTMENT or WALK IN FOR 30-45min AURICULAR TREATMENT. Auricular (ear) acupuncture :: Ear acupuncture is a great way to experience acupuncture for the first time. The ear is actually a microcosm of the whole body. By placing needles at specific points on the cartilage of the ear, our therapists can support you in restoring yourself and feeling better, fast. If you are curious about the practice or maybe nervous about needles, try this minimal treatment style and ease into full treatments down the road. Ear acupuncture is great for maintaining balance within the body, supporting the body in detoxing from addictive substances, habits and emotions and it's a great way to restore + relax! Check out the options below and try an auricular treatment today! While we do allow walk-ins for auricular acupuncture, we ask for your patience as there may be a wait for service. Reservations are prioritized. $20 Detox Treatment :: 10 needles (5 in each ear) :: Our therapist places up five needles in the outer cartilage of each ear, and you rest for up to 45 minutes while laying back in our comfortable zero-gravity chairs. While the needles work to stimulate your body's ability to rejuvenate itself (especially liver, kidneys + nervous system) you may fall asleep, experience a meditative state or just feel calm and relaxed. $10 Balance Treatment :: 4 needles (2 each ear) :: Designed to open up the energy channels in the body and regulate the flow of energy throughout. Lay back and relax, while observing sensation and small changes within the body. Our zero-gravity chairs and cozy blankets will keep you comfortable while you rest for 20-30 minutes and get up refreshed! $5 Needless Acupuncture (Ear Seeds) :: Small black seeds from the Vaccaria plant are secured on the ear with a piece of adhesive tape over specific acupressure points. The continuous mild pressure they exert is amplified by stimulating the seed or pellet with a few seconds of fingertip massage every few hours. Ear seeds are non-invasive and do not puncture the skin, but provide effective anxiety relief, suppression of cravings and gentle support for the body + its systems. Get ear seeds and "keep it moving." You don't have to lay down to feel the effects. This is a great on-the-go treatment and the adhesive may last up to 3 days! You may also ask for ear seeds to be placed post-acupuncture to keep that WOOSAH feeling going after you leave the salon. 12-4pm :: Reiki Energy Healing with Angelana :: Personal 30min/$35 :: For 30min Group session(2-4people), book Personal and we will make accommodations in the salon for you. Group Reiki is $20 per person. ** NEW OFFERING 1st + 3rd Sundays only ** 5-6pm :: Simmer Down Sanctuary Restorative Movement + Restful Reiki with Maria Lanier aka Sista Shaman :: 60min/$10 Great for beginners + anyone looking for gentle/supportive space to move, breathe, BE and HEAL! Join us for Maria’s Class this sunday! We are excited about a new addition to our community healing space: Haji's Self Care Station is an easily accessed, comfy-cozy space where you may engage with self care tools designed to relax and restore you. Choose 15min with our CHI Machine (an electronic device that swings your legs back and forth to increase blood flow/CHI, drain lymph and provide the same bodily effects as 60minutes of walking), lay back and let our electronic massage tool work tensions out of your back muscles, or choose 15min with our neck and shoulder massage tool. Arrive a few minutes before the start of your yoga class or healing service and reserve 15-minutes in the self care station to loosen up, de-stress and ease into what's next. *Are you exhausted and finding it difficult to REST at home? Check-in at Haji Healing Salon and TAKE A NAP, within the sanctuary of our safe space. Pay $10 to receive a lavender-scented eye mask, ear plugs, blanket, pillow and your own zero gravity chair. Reclaim your DREAM TIME good people and join us for up to 90 minutes of RADICAL REST! Our GO FUND ME is LIVE and accepting donations every day. www.gofundme.com/hajihealingsalon :: thank you for giving, sharing and showing up in this space for RADICAL HEALING! Sunday Sanctuary Community Yoga is a celebration of LIFE! We come together to drop into ourselves, breathe deeply and move intentionally. Aya uses music, yoga and her own brand of affirmative speech to help community connect with and fully realize the joy of being in the body. The all-levels flow practice, is best suited for those who have a basic understanding of Vinyasa yoga. Please bring your mat, a towel (if you sweat with moderate practice) and your open heart. Come ready to be in community with other amazing folks who also share a love of yoga and safe spaces to practice. Your $10 class fee supports the Haji Healing Salon's Community Acupuncture program. See you soon! Community acupuncture means your friend, family, or dear one can be in the chair next to you. That you can share in the experience of being needled, lay back, relax and bask in the nexus of healing energy, created by the collective. C.A. means more people have more access to pain relief, stress relief, trauma support and the all around healing power of acupuncture. Our $25 sessions include a short consultation with the therapist and 45-60 minutes rest time for you. Acupuncture with a revolving roster of skilled community-partners is offered from 12pm-4pm every Sunday. * Reservations are required. Please note: you may WALK-IN for a shorter, auricular (ear acupuncture) session. Walk-ins may incur longer wait times. Reiki is administered by "the laying on of hands" and is based on the idea that an unseen "life force energy" (also known as Prana or Qi) flows through us and stimulates our aliveness. If our "life force energy" is low, then we are more likely feel stressed and get sick. When the vital life force is high, we are more capable of being happy and healthy. Reiki is a healing art that offers you a chance to relax deeply, while tuning in to the subtle sensations inspired by the attunement. Treatment is given while you lay on a massage table, fully clothed. You will feel light touches and the movement of energy throughout your body. Relax and fall into your witness consciousness for best results. Angelana Grant + Courtney Smith are skilled Reiki Practitioners who share the privilege of supporting the energetic health of the Haji Healing Salon community. Courtney offers 30 minute sessions for $35 (60 minute sessions for $65 by special request) every second + fourth Sunday while Angelana is with us every first + third Sunday. Book an appointment today, to start feeling the many benefits of Reiki attunement. Our highly-skilled chair massage therapists are absolute miracle workers! Tim Timson's goal is to provide you with a chair massage so thorough, your thirty minutes in the chair will feel like 60 on the table! Tim is very communicative during session, regularly checking in to make sure you are receiving the right amount of pressure. His final touch at the end of your treatment is a beautiful lavender-scented face and head massage that will leave you BLISSED OUT! Post-massage he'll even ask you for feedback, so he can continue improving his healing art. The chair is no compromise with Tim, as his goal is to work your whole body. Still, if you'd prefer a table massage, you may always request one and we are happy to oblige if the schedule permits. Tim is with us 2nd + 4th Sundays. You haven't lived until you have been touched and told your TRUTH by Toni Asante Lightfoot. Toni uses Tui Na, Thai Body Work and Shiatsu massage techniques to warm, loosen and liberate all the parts of US. She tunes in and listens carefully to each beautiful body, for any inspired guidance she might glean and offer as a support on the healing path. Many have been blown away, by Toni's powerful insights. Book Divine Body Work 1st + 3rd Sundays from 12:00-4pm by clicking the link below. Toni’s bodywork is also now available on TUESDAYS between 4-8pm with TWO one hour spots ($65) at 6pm + 7pm. Wear comfortable active wear (yoga clothing is recommended) for this experience. Divine bodywork: 30 minutes $35(chair). Hour-long appointments are offered on the table 60min/$65. Request the table for your 30min massage for a $5 up-charge. Deidra has been an initiated priestess of OSHUN for nearly 16 years. She has studied as a diviner and ritual practitioner under the apprenticeship of master diviners and elders in several branches of the Yoruba and Edo spiritual systems. 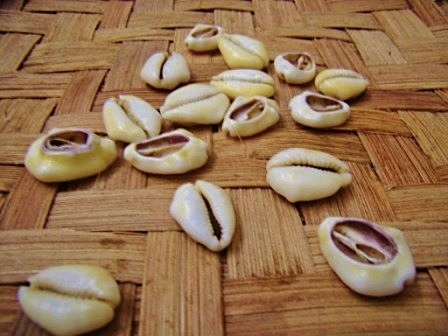 Deidra uses cowrie shell divination in her counseling sessions, as her practice derives from the Afro-Cuban Lukumi tradition. Through the ritual use of prayer and alignment with the energies of the Orishas, ancestors, benevolent accompanying spirits and the person's first Orisha, Deidra addresses any impediments revealed by the Ori (enlightened self) of the client. She then assists clients in realigning with their divine purpose. Deidra enjoys helping her clients embrace and celebrate the aspects of their spiritual profile that are supporting their growth and evolution. Her sound guidance and helpful tools enhance the spiritual health and wellness of each person she counsels. Receive counsel from Deidra every second + fourth Sunday. 30min sessions are $30. Dayna offers Tarot counseling on first Sundays of each month. Reserve online and come have a seat at Dayna’s table to have the wisdom of the tarot illuminated and interpreted for you. While classical tropical astrology is based on the orientation of the Earth relative to the Sun and planets of the solar system, sidereal astrology deals with the position of the Earth relative to both of these as well as the stars of the celestial sphere. The actual positions of certain fixed stars as well as their constellations is an additional consideration in the horoscope. To learn more about this Zodiac chart and your position within it, check out Dayna's website via the link below. Be sure to make your reservation to get counsel with The People's Oracle every 2nd Sunday of the month at Haji Healing Salon. 30min/$30. Haji Healing Salon is delighted to present Shannon Harris’s unique sound-vibration therapy to Haji community, once monthly during Sunday Sanctuary. Book an immersive 30-min therapy session designed to relax you deeply through an integrative experience of medicinal music and vibratory massage. This therapy is administered on a heated jade mat, placed atop our massage table. An eye pillow and headphones offer you to the chance to tune out the exterior world and tune into your SELF and this truly hypnotic, healing experience. Dubbed by one client as “afro-futuristic massage” you don’t want to miss this special offering offered at a special discounted rate for Haji community! Book a 30MIN session at $35. Looking for a full hour with Shannon? Book the 3pm time slot and go deeper! Shannon is with us every 2nd Sunday of the month. KemeTones Cosmic Sound Healing is a non-invasive healing modality that is very similar to acupuncture. While acupuncturists use needles to bring the body's systems into alignment, Arit uses tuning forks that are each tuned to different celestial frequencies to relax, realign and restore our bodies. This treatment is given on a massage table. If you wish to have a pre-session Kemetic Sidereal Astrology chart done , Arit will use it to inform your treatment protocol. Book a session with sister Arit every third Sunday and enjoy this beautiful, balancing treatment, by clicking the button below. Fill out the accompanying form to have your chart created before you arrive.